Before I tell you my thoughts on The Faerie Ring, I wanted to share my experience with you about Kiki Hamilton, the author. I have a special place in my heart for this author. 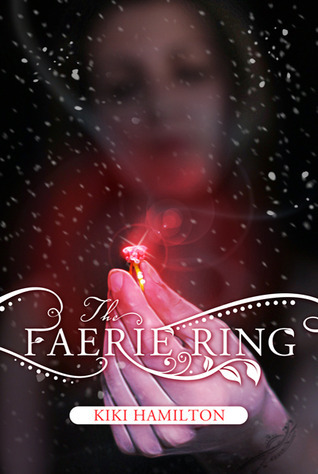 Back when I started this blog, I saw The Faerie Ring on goodreads and was immediately taken in by the cover. I decided to get up the nerve to send an email to Kiki and she was sweet enough to send a reply. She was the first author I had ever contacted and she also sent me my very first swag. Since she was so sweet to me, I really hoped that her book was a success and that it was as good as I wanted it to be. If you are a fan of fantasy, fae, or sitting down and reading a book that will have you daydreaming about it and burning your dinner- read The Faerie Ring. You won't regret it! I don't really *ever* comment on reviews, but I saw your sweet note and I just wanted to say thank you! :-) I'm glad you liked the story! Thank you for commenting! I meant every word!